This is an Asana Practice class along with Teaching Methodology. Please bring props for Practice. Yin and Yang and the Five Elements form the roots in the tree of health, and Chinese medicine and philosophy is based on these energy principles. This series will introduce Five Element theory with yoga asana. We will use Five Element Theory to look at how Chi may flow with the rhythm of a mindful and energetically aligned practice. Yin meridians flow upwards, and Yang meridians flow downwards. 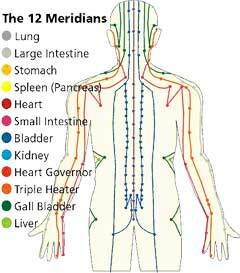 Meridians are the pathways of Chi and blood flow throughout the body. Chi flows continuously from one meridian to another, and a break in flow is an indication of imbalance in health. If Your vitality or energy is diminished, it is an indication that the body’s organs or tissues are functioning poorly, and your Chi flow is not enough. The classical Western elements were concerned with substances or natural qualities, while the Chinese are concerned with process and change. The word Element is used within the context of Chinese medicine with a different meaning to its usual meaning. The Chinese view of human health differs from the Western view, as Chinese have always focused attention on the function rather than the form of the vital organs. We will use these Meridian pathways as a way to work in Yoga Asana. Western medical human physiology is based upon the anatomical locations of various organs, while the Chinese concept of ‘organs’ includes a specific type of energy that infuses each organ, as well as the energy meridians that channel organ energies to and from other parts of the body. The Wu Xing, 五行 known as the Five Elements is a concept that traditional Chinese use to explain a wide array of phenomena, from cosmic cycles to the interaction between internal organs. The “Five Elements” are Wood (木 mù), Fire (火 huǒ), Earth (土 tǔ), Metal (金 jīn), and Water (水 shuǐ). The classical Western elements were concerned with substances or natural qualities, while the Chinese are “primarily concerned with process and change. The word Element is used within the context of Chinese medicine with a different meaning to its usual meaning. Yin meridians flow upwards, and Yang meridians flow downwards.